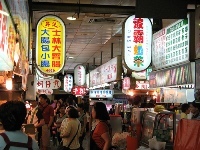 Taipei's biggest and best night market is not just for shopping. Instead, it is a cultural experience that every visitor should enjoy. The action begins when the sun sets and thousands of stalls and stores open for business. They sell everything from clothing to pets, souvenirs and DIY tools. It's wise to visit with an empty stomach, given the array of tempting treats on offer. Address: The neighbourhood of Dadong Rd., Danan Rd., Wenlin Rd. and Jihe Rd., Shilin Dist., Taipei City 111.